By 1880 grain elevators had grown in capacity and could store 560,000 bushels each. In 1881, 3,332,176 bushels of grain passed through the Zenith City. So much grain poured through Duluth that year that it all but forced the organization of the Duluth Board of Trade. Five years later, that number jumped to 22,425,730. One of the board’s members, George G. Barnum, was a distant cousin of P. T. Barnum, of Barnum & Bailey Circus fame. Duluth’s Barnum didn’t prey on suckers; he was so admired for his leadership he was known as the “Grand old man of the Board of Trade.” His Barnum Grain Company would merge with others to form General Mills. One big problem with the early grain elevators was that they were made of wood, and grain dust is highly combustible. Many were lost to fire, including Elevators A and Q, which burned on November 27, 1886, taking with them about 500,000 bushels of wheat, corn, flax, and oats, and the lives of two men. The loss was so substantial it actually led to a rise in value of the Chicago grain market. Elevators continued to pop up on Rice’s Point, most built between 1885 and 1902, and by 1910 ten of the storage facilities lined the eastern side of the point. Ten years earlier Frank H. Peavey and Charles H. Haglin had graced Rice’s Point with the first tubular concrete silo elevator (they had finished building an experimental version of such an elevator in St. Louis Park, Minnesota, earlier that year). Because of concrete’s fireproof qualities, facilities like the Peavey elevator eventually replaced their wooden counterparts. 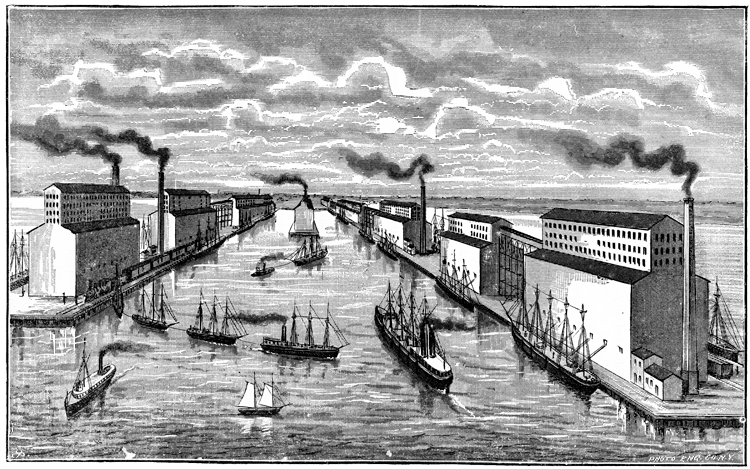 By 1920, Duluth’s grain elevators could hold over 36 million bushels of grain and loaded 62,723,563 bushels onto ships. 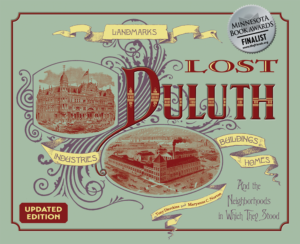 Despite this, over the years Duluth’s importance in the grain trade declined, enough so that in 1946 the Duluth Board of Trade made its last futures transaction. The Peavey Grain Elevator — found, like all of Duluth’s grain elevators, on Rice’s Point — was the first tubular silo facility made of concrete.